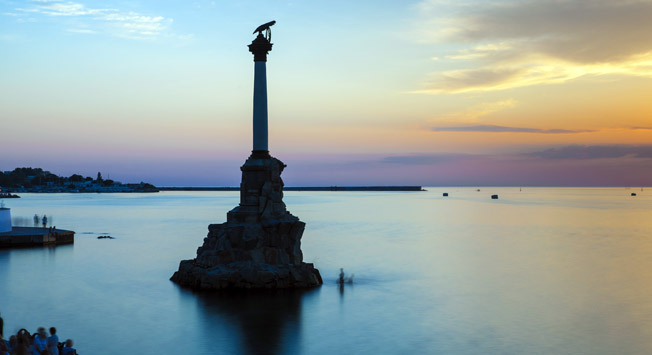 Sevastopol, a city with a special status on the Crimean Peninsula. Issue of Crimea’s status was not discussed during the phone conversation between Russian and U.S. Presidents Vladimir Putin and Donald Trump in late January, Kremlin Spokesman Dmitry Peskov told reporters on Feb. 15. When asked if Trump raised the issue of the Crimean status during this contact, Peskov said: "No, he didn’t." Peskov gave no new comments on whether the Russian leader gave explanations on the situation in Ukraine during the conversation with the U.S. president. "We (earlier in an official statement) said everything what we wanted to say on the outcome of the phone conversation that you mentioned," Peskov told reporters. On Feb. 14, White House Press Secretary Sean Spicer said that Trump had clarified he expected Crimea’s return to Ukraine and de-escalation in Donbass. The Kremlin’s press service earlier said that during their phone conversation on Jan. 28, Putin and Trump showed determination to conduct an active joint effort on stabilizing and developing Russian-U.S. cooperation. The sides discussed vital international issues and also major aspects of the Ukrainian crisis. The leaders agreed to establish partner-type cooperation in those and other areas. The Republic of Crimea and Sevastopol, a city with a special status on the Crimean Peninsula, refused to recognize the legitimacy of Kiev authorities brought to power amid riots during a coup in Ukraine in February 2014. Crimea and Sevastopol adopted declarations of independence on March 11, 2014. They held a referendum on March 16, 2014, in which 96.77 percent of Crimeans and 95.6 percent of Sevastopol voters chose to secede from Ukraine and join Russia. The Russian president signed the reunification deals March 18, 2014. Despite the convincing results of the referendum, Kiev refused to recognize Crimea as part of Russia.